Curious about what a career with the European Union feels like? Then a traineeship at one of the EU institutions and agencies can show you. While going for gold towards that dream EU career maybe what you are aiming for, we can’t deny the fact that it helps to get yourself oriented about the job first. That way, you will get yourself familiarized with the work; all the while getting a first-hand experience even before you have begun and joined the actual competitions. With the EU traineeships, around 1,200 young university graduates are offered the chance to increase their professional skills, develop their personal qualities, and enhance their EU knowledge between 3 to 5 months. On top of this, they will be given the opportunity to work in the EU environment while getting to experience the daily tasks of EU officials. Since trainees tend to be fresh university graduates, their tasks will be similar to those of the lower administrator grade officials. However, through the wide range of fields offered, they will be exposed to varying opportunities across multiple fields of competiton law, human resources, environmental policy, communication, and more. Furthermore, the majority of the EU traineeships are paid, usually in the region of 1000€/month and most are based in Brussels or Luxembourg. Under the European Parliament, this traineeship’s goal is to contribute to EU citizens’ European education and vocational training as well as provide an insight into the work of the European Parliament. It will last for 5 months with March and October as the starting dates. They will also be invited to participate in a study programme that includes visits and conferences at other EU institutions in Brussels, Luxembourg and Strasbourg. The duration for this traineeship lasts between 2 to 5 months with both the starting dates and application period happening in February and September. Third, fourth- or fifth-year university students of EU nationality who have to do a compulsory training period as part of their course. In this case, this traineeship is not paid. However, there will be reimbursement of travel allowance, GSC restaurant reduction card, and health/accident insurance. With the unpaid traineeship offered above is its paid counterpart. The tasks are the same as those mentioned. However, this paid traineeship lasts for 5 months with 1.176,84 € paid per month, reimbursement of travel allowance, and a GSC restaurant reduction card. Furthermore, what sets this apart is that applicants must be EU nationals who, by the deadline for submitting applications, have completed at least the first part of their university studies and have a degree certificate or equivalent. Moreover, they will be expected to handle tasks particular to their department. The traineeship lasts for 5 months and is paid 1,176.83 € per month with reimbursement of travel expenses. The starting dates are on March and October. Registry of the General Court or the Interpretation Directorate. This traineeship lasts for 10 to 12 weeks. Participating in ad hoc studies. The duration of this traineeship is three to six months, which can prolonged once up to 12 months, paid around 1,050€ per month. The European Court of Auditors organises three traineeship sessions per year in areas of interest to its work. Traineeships last for three, four, or five months and are paid around 1.350€ (depending on the budgetary appropriations available). Starting dates are on February, May, and September. Traineeships under the European External Action Service offer opportunities in EU Delegations around the world. It is considered as an educational project that does not foresee any contractual or employment relationship with the Delegation. The traineeships last for a maximum of 6 months and is offered as paid or unpaid. Those who opt for the paid traineeship must be young graduates with less than one year of professional experience. On the other hand, unpaid traineeship is awarded to students already residing and studying in the host country. The European Economic and Social Committee’s in-service training offer an opportunity to chosen trainees to learn about the EESC’s roles and activities and to acquire professional experience in a multicultural environment. The traineeship is offered starting February and September and is paid at around 1,170 € per month for 5 months duration. Another traineeship offered by the EESC will be for those who prefer short-term duration, lasting 1 to 3 months. However, unlike the one above, this traineeship is not paid. If you want to get a glimpse of the work at the Committee of the Regions, then a traineeship with them is for you. You will find yourself at the heart of the dynamics of political assembly all the while familiarizing yourself with CoR’s objectives and work on European integration. Your work will be equivalent to that of junior executive-grade officials (AD5) with opportunities to work on specific tasks according to the unit assigned to you. This traineeship is paid around 1,200 € per month, lasting for 5 months. The starting dates are on February and September. The CoR offers internships for those government officials who are looking to expand their knowledge on the objectives of European cooperation and integration through the work of the CoR. They will acquire stakeholder knowledge and experience to the policy processes of the CoR, while providing practical knowledge/feedback of the workings of the CoR to the local and regional levels. The traineeship will last from 1 to 4 months and can be extended to 6 months. There will be no pay while remuneration is provided by the sending institution. Professionals working in a post with duties corresponding to the level of an EU Administrator. Trainees chosen for this traineeship will have study periods at the CoR, allowing them to to complete a concrete project, while providing unique, first-hand experience of the workings of the CoR. The traineeship will last from 1 to 4 months and can be extended to 6 months. Also, there will be no pay. Obtained at least a Bachelor degree. This traineeship are for those who wish to acquire an understanding of the Bank’s work or gain experience in the field of their studies. It is paid and lasts 1 to 5 months, 6 months if requested by Universities. Do you have a keen interest in European Union public administration, particular, in how the EU administration relates to citizens? Then a traineeship with the European Ombudsman is for you. The traineeships are intended to provide practical experience of the work of the European Ombudsman and to build on the knowledge and skills acquired during the trainees’ studies. Work on IT projects or on research relevant to the work of the Ombudsman. Furthermore, trainees will work under the direct supervision of an official or agent of the European Ombudsman, normally a Head of Unit or equivalent. If interested, the traineeships start in January and September. The duration is a minimum of 4 months, with a possible extension of 8 more months (depending on performance) – for a total of maximum 12 months. It is also paid around 1.300€ per month in Brussels and around 1.500€ per month in Strasbourg. Traineeships with the European Data Protection Supervisor allow trainees to acquire practical experience of the EDPS’ day-to-day activities as well as in data protection. The starting dates are on March and October, with the traineeship lasting for 5 months and paid around 950€ per month. Put into practice your educational and even professional backgrounds as you contribute top the work of FRONTEX in line with their expertise and interests. Frontex’s traineeship programme provides an opportunity to gain practical working experience of cooperation in the field of external borders of the European Union, to acquire knowledge of the European Union, its institutions and activities and to put into practice knowledge acquired during studies or at work. The programme lasts 3 to 12 months and is paid around €720 per month. EASA offers opportunities in all areas of the organization aim to give an understanding of the Agency and its role within the activities of the European Union. The traineeship programme will last for 12 months and is paid. Those interested to learn about the Centre and its role within the activities of the European Union will take on this opportunity as you will also be provided an opportunity to acquire practical knowledge and professional experience. The traineeship will last 3 to 9 months and is paid around 1,505€ per month. With this traineeship you will be given a unique and first-hand experience of the workings of CEDEFOP and of the EU institutions in general. You will also be provided an understanding of the objectives and goals of the EU integration processes and policies. You will be paid €919.4 per month if from abroad or if residing in Greece who need to move to Thessaloniki for the duration of the traineeship. On the other hand, trainees already residing in Thessaloniki will be paid €689.5 per month. The starting date is on October. Have completed the first cycle of a higher education course (university education) and obtained a full degree or its equivalent. The traineeships will last 3 to 6 months and is paid around 1,300€ per month. Starting dates are on March and September. Nationals of a Member State of the EU or a national of the European Economic Area (Norway, Iceland, Liechtenstein). Like some traineeship opportunities above, EFSA provides paid and unpaid traineeships to those who are at the start of their careers in their chosen field. The duration is 5 to 12 months. Nationals of EU Member States, EFTA countries, and of countries benefiting from the EU pre-accession programme. Gain a unique and first-hand experience of the workings of EUROFOUND through their traineeship programme as you acquire practical experience and knowledge of their day to day work within the wider European and Institutional context. 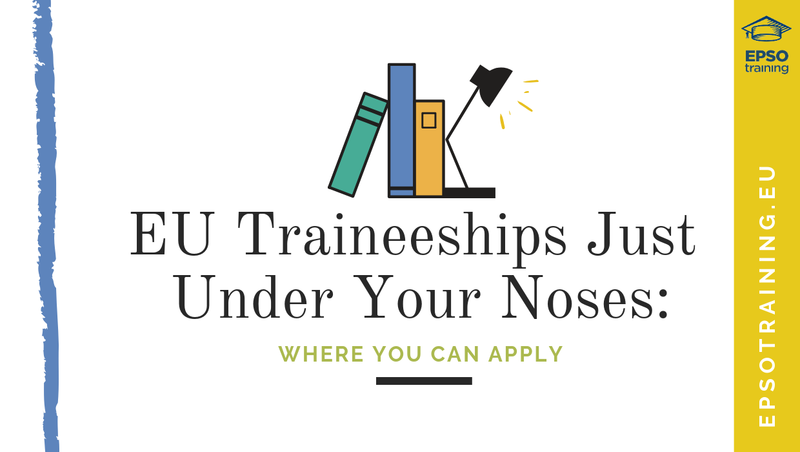 This traineeship is paid around €1,410 and lasts 6 months up to 12 months. Acquire work experience in an EU agency context. This traineeship will last up to 6 months and is paid around 750 € per month. Either nationals of an EU member state or an EFTA country or an IPA qualifying country. Provide training to university graduates – in the field of nuclear engineering, physics, administration and communication. The duration of the traineeship is 4 to 9 months, paid around 1.000€ per month with reimbursement of travel expenses. Starting date is October. The duration is 3 to 6 months and is paid, with starting dates on March and September. The traineeship programme at EMA provides trainees insight into EMA and its role within the EU and the European medicines regulatory network and provides valuable professional experience. This traineeship lasts 6 to 18 months and is paid around £1,550 per month. Starting dates are on April and October. Traineeships within the EMCDDA aim to provide trainees with practical knowledge of the workings of a European agency. It lasts from 3 to 8 months and is paid depending on the budget. Work and have a first-hand experience with ENISA through their traineeship opportunity given to those who want to contribute their ideas to the institution. You can do so from 3 to 12 months, all the while getting paid 1,000€ per month. Help achieve ERA’s goals as they play an important role in the development of the Single European Railway Area (SERA). You will be given an opportunity to participate in real projects related to your specific background, along with the best professionals and within a welcoming and stimulating work environment. The duration of the traineeship is 3 to 5 months, paid around 1,200€ per month. Starting dates are on March and October. Get work experience at ETF as you participate in the administration of co-operation in the field of education and training, to gain an insight of the ETF’ objectives and activities and toyou’re your learning into practice. This is a paid traineeship that lasts 3 to 6 months. Citizens of both the EU Member States and the ETF’ partner countries. Contribute to the Agency’s mission in helping to make fundamental rights a reality for everyone in the EU through their traineeship programme. This is a paid traineeship that lasts for 9 months. Starting date is October. Nationals of the Member States of the European Union and EU candidate (Albania, FYR Macedonia, Montenegro, Serbia, and Turkey) and potential candidate (Bosnia and Herzegovina and Kosovo) countries. Every year Europol offers a number of internships that provide individuals with the opportunity to learn more about the agency’s activities and put their learning and skills into practice by contributing to Europol’s mission. Be part of a multicultural team as you take on their traineeship programme which lasts 3 to 6 months and is paid around 790 € per month. Very good knowledge of at least two European Union languages (of which one should be English). Understand EUIPO’s databases and technical knowledge. Trainees also work in other specific areas of expertise such as human resources, communications or information technology. This paid opportunity lasts for 5 months. Have a working knowledge of one of Office’s five working languages (English, French, German, Italian and Spanish). Another traineeship opportunity given by EUIPO are for those young university graduates who want a unique first-hand experience of the European Union in general and the Office in particular. Furthermore, this traineeship helps participants understand the objectives and procedures relating to the European Union trade mark and Community design system, as well as to IP infringement and enforcement matters. This paid opportunity will last for 12 months. Unlike those EUIPO Traineeships above, this particular opportunity is given without pay, intended for university graduates who, in the course of their studies or in some other manner, have already gained some initial experience in the areas of work of the Office. The duration is 2 to 6 months. This final traineeship opportunity given by EUIPO is intended to provide young professionals with practical experience of the European Union in general and the EUIPO. This is a paid traineeship that lasts for 12 months and 2 weeks. Starting dates are on September and October. With a traineeship at SatCen, acquire practical experience and knowledge of the day-to-day SatCen work while performing specific tasks and receiving input from recent graduates bringing up-to-date academic knowledge. This traineeship lasts 2 to 6 months (may be extended up to 12 months), paid around 1,000€ per month. Training after university education (or its equivalent) within 5 years after the last university degree. The traineeships will last 3 to 5 months and are paid depending on the place of recruitment. Nationals of the Member States of the EU, candidate countries benefiting from a pre-accession strategy and other countries contributing financially to the Framework Programme. Throughout the year, EUROJUST offers a number of internships to provide individuals with the opportunity to learn more about the activities of the organisation, and put their learning and skills into practice by contributing to EUROJUST’s mission. This is not a paid traineeship that lasts 3 to 6 months. Or, alternatively, have relevant professional experience that would benefit the internship. The translation centre offers traineeships to those who wish to acquire an understanding of the Centre’s areas of activity and gain personal experience in a multicultural and multilingual environment, with the opportunity to make contacts. Trainees will work 3 to 6 months and are paid 25% of the basic monthly salary of a temporary member of staff in grade AD5. Have a thorough knowledge of one of the official languages of the European Union and a satisfactory command of another EU language.